The statue of the Greek god Zeus at Olympia, one of the world's greatest statues, was created in about 450 BC by the renowned Greek sculptor Phidias. It is in honor of this god that the Ancient Olympic games were held. During those times truce is declared and wars are stopped. Players and athletes from all over the places traveled to a place in Greece called Peloponnesus. These Olympic games were started during 776 BC. Phidias is also credited with the construction of the famed statue of the goddess Athena for the Parthenon in Athens. The statue was reminiscent of the Michelangelo's paintings at the Sistine Chapel. Zeus's seated figure was 12 meters in height. His body was ivory and his robe, hair and beard, gold. The throne was made of cedar and embedded with precious jewels. Zeus's outstretched right hand held a small statue of Nike, the goddess of victory. The statue was so high that visitors described the throne more than Zeus body and features. The legs of the throne were decorated with sphinxes and winged figures of Victory. Greek gods and mythical figures also adorned the scene: Apollo, Artemis, and Niobe's children. The Statue of Zeus was housed in the 64 meter (210 foot) long Temple of Zeus, which could be called a wonder on its own merits. The magnificent temple of Zeus was designed by the architect Libon and was built around 450 BC. Its 72 exterior Doric columns made a stunning architectural statement. And, its pediments and metopes were ornamented with outstanding sculptured artwork. The statue's head nearly scraped the ceiling of the Temple of Zeus. Phidias wanted to emphasize Zeus's mightiness. In the I century AD, Roman emperor Caligula tried to take the statue to Rome but failed. 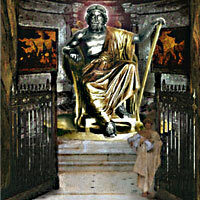 The statue inhabited the Temple of Zeus for about 850 years when some Greeks moved it to Constantinople which is modern day Istanbul. It was a well-timed action because the Temple of Zeus was destroyed shortly thereafter. Unfortunately though the statue's newly acquired home burned down in 462 AD. Even before this the temple site was ravaged by floods, landslides and earthquakes to the extent that the structure was badly damaged. Today nothing remains at the site of the old temple except rocks and debris, the foundation of the buildings, and fallen columns.